Taurus Hill Observatory | Exoplanet KOI 1452b observed at Taurus Hill Observatory. Exoplanet KOI 1452b observed at Taurus Hill Observatory. Posted April 20th, 2011 by Harri Haukka & filed under Extrasolar Planets, Highlights. 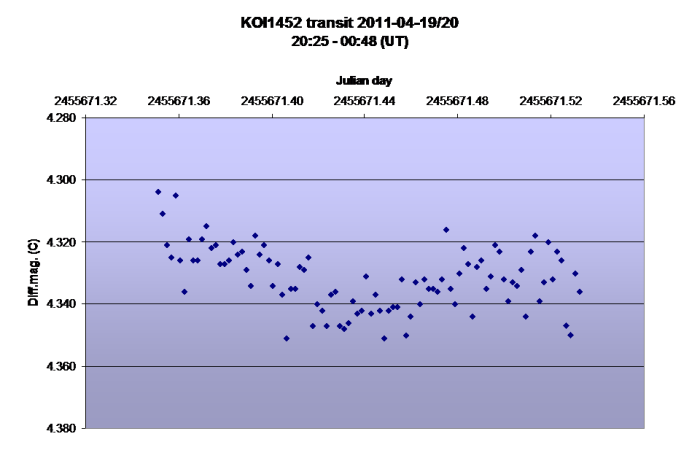 Exoplanet KOI 1452b was observed at Taurus Hill Observatory second time 19./20.4.2011. The object is still listed as unconfirmed in Keplers exoplanet discoveries. According the THO measurements the duration of the transit was 118.7 minutes and the dimmening of the mother star 14.8 mmag. This observation has been published in TRESCA database (CREDIT TRESCA: http://var2.astro.cz/EN/tresca/transit-detail.php?id=1303267527 ).